129.26 Acre San Diego County "Atlantis Ranch"
San Diego County's "Atlantis Ranch"
The Best Buy on the Market in San Diego County! This is an incredible opportunity to own one of the last Large Ranches in San Diego County. 129.26 Acres in Three Legal parcels in Weather Paradise "De Luz Canyon", Fallbrook, California. Sunset Western Garden Book describes this as "Zone 23" "One of the most favored gardening climates in North America for the growing of Subtropical plants". The three Legal Parcels are highlighted in Yellow in the above photo. The Southmost parcel, 80.19 Acres, Immediately North of that a 40.24 Acre parcel with the home and mobile home, 1/4 mile East is the 8.83 Acre parcel adjoining Calle Roxanne. The photo on the right above, compliments of Earthviewer is also a link to the location online with Earthviewer... where you can zoom in and out.. as well as pan left and right. 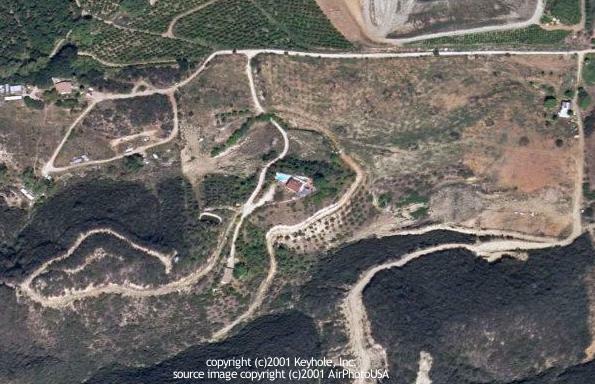 The image shown above is the actual parcel.. and the main residence (red tile roof & pool) is central in the image. All three parcels have been surveyed within the past month, and all corner's marked. If using Netscape Browser, you may right click on images, view the image, and see greater detail in a larger photo image. The photo on the left above is the mobile home, currently rented, and the photo on the right is the 1976 vintage custom residence. The Brick patio, with views in all directions is shaded and of course private, and the bedrooms upstairs all have access to broad verandas to take in the Panoramic landscape and solitude. The home has deferred maintenance and all improvements are being sold in "As-Is" condition.... but this is an incredible opportunity. When listed in February the property sold immediately... fell out of escrow.. sold again in one day.. and fell out of escrow again. This is a diamond in the rough... that is an incredible value.. for the land alone.